Because the girls are grown and fledged, the way in which we celebrate Christmas has changed. That being said, we do have a tree in the living room, a cut tree that I found while driving through Nippenose Valley. Having a harvested tree in the house is one of the ways we have found to reduce some of the stress and work of the holiday. When Celia was five she observed that harvesting a tree, for the sole purpose of bringing it into the house and admiring it for a short while, seemed nonsensical. Although I will not claim to remember the exact way in which expressed her youthful logic, I can tell you that it was sound for it is true that plants are most beautiful when their roots are spread through the soil of their natural environment, when they are healthy, and most especially, when they are alive. What a wasteful thing it is, she observed, to cut down a thing of beauty. It was when she expressed these ideas that we began a family tradition of purchasing a live tree with which to celebrate the holiday. For nearly 25 years we would find a live, wrapped, tree, haul it into the house, adorn it with our collection of holiday regalia, admire it for the duration, haul it outside and heal it in until spring at which time we would then plant the tree as part of our farm landscape. It was a tradition that we practiced for all of those years … and for all the right reasons. I am feeling just a bit guilty as I write because it was I who convinced Joanna that we should forgo the tradition this year and could do with a U-Cut from down the road. I argued that live trees are expensive (perhaps four or five times the price of a cut tree), very tough to haul around (especially if the root ball is wet a live tree may weigh nearly 300 pounds), and it is always difficult for the tree to make the transition from cold-to-warm-to-cold and then survive the long wait until spring. Yesterday, our observation of the holiday included a walk along Pine Creek, at Waterville. We kept to the trail on the outbound leg and Joanna suggested that we follow an old post road on the return. The scenery on the inbound leg was beautiful. It had good topography and the ground was a mosaic of rocks, fungi, liverworts, mosses, ferns, and trees. 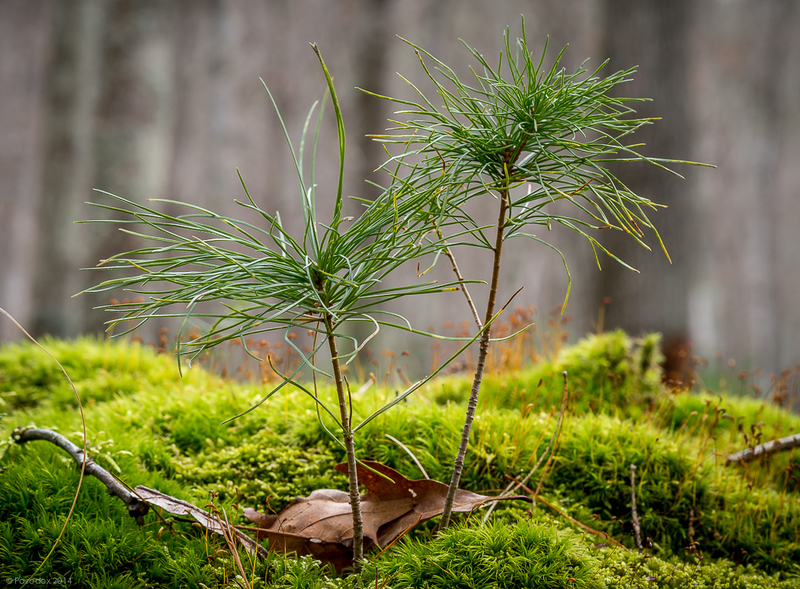 About half way back Joanna pointed to a number of pine seedlings which had established themselves as part of a large, discontinuous, carpet of moss which clung, brightly and with a profusion of color, to the forest floor. The area in which we were hiking forms the southern-most reaches of the Pine Creek Gorge. Although heavily wooded along its length, the steep slopes which form the walls of this beautiful valley have thin soils, and plants well adapted to such conditions may be found in abundance. I was glad to see such a large number of evergreen seedlings in obvious good health. I was glad to know that the likelihood they would thrive and grow to replace their elder brethren all around was high. I was glad because the roots of these little plants were spreading through the soil of their natural environment, they were healthy, and most especially, they were alive. Perhaps I will rethink the logic of our holiday tree, next year.